Scarce nautical chart of the Inner Passage and pirate haven of Madagascar. A Chart of the Inner Passage between the Coast of Africa and th Isle of Madagascar. An extremely scarce 1797 nautical chart or maritime map of the inner passage between Madagascar and southeast Africa. The chart includes the coast of modern day Mozambique from Cape Delgado and the Comoros Islands southwards as far as modern day Maputo (Da'Lagoa Bay). The island of Madagascar is rendered in full with rich inland detail throughout. Insets in the upper left quadrant illustrate the Comoros Islands, the Bay of Johanna, and Foul Point and Bay (just south of Ile Sainte-Marie). Numerous depth soundings throughout. Rhumb lines radiate from various compass points. The Mozambique - Madagascar region was one of the earliest parts of sub-Saharan Africa to be settled and explored by Europeans. It was first explored by the Portuguese on their way around Africa to India. Rumors of gold wealth associated with the Biblical treasures of King Solomon (Ophir) on the interior led to the development of Portuguese entrepÃ´ts in Sofala and along the Zambezi River. The Kings of Portugal had visions of a gold rich colony to compete with the Spanish discoveries in the Americas; however, most of gold mines of Zimbabwe had been exhausted hundreds of year before. Instead the region developed as a base for the trip around Africa to the Indies. In the 17th century, Madagascar, with its forbidding reef-ridden coastline and amicable population became a pirate haven, hosting such infamous buccaneers and John Avery, Henry Every, Thomas Tew, and Captain Kidd. 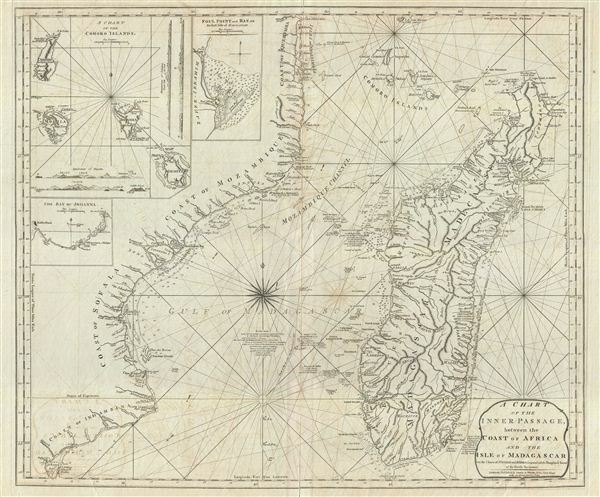 By the time this map was drawn the passage in and around Madagascar had become particularly dangers. Pirates had established themselves on Nosy Boraha (here Nossi Ibraham or Isle St. Marys) or as it is more commonly known Ile Sainte-Marie, an excellent and sheltered port on the northeastern side of the Madagascar. Near here, legends tell of a utopian pirate republic, called Libertatia or Libertalia, established in the 17th century. When Captain William Kidd visited in 1697 to undertake repairs to his ship, he is said to have lost half his crew to the delights of Libertatia. Nonethelss by 1825 piracy in the region had diminished significantly under continual pressure from European merchant navies. Cartographically Laurie and Whittle credit earlier mappings by the French chartmakers Jean-Baptiste d'AprÃ¨s de Mannevillette and Jean Baptiste Bourguignon d'Anville as well as updates and revisions drawn from the maps and journals of various unnamed British navigators. This map was published by Laurie and Whittle from their offices at 53 Fleet Street, London, on January 1, 1797. The map was issued independently as well as offered in their 1797 East-India Pilot, or Oriental Navigator. Very good. Verso wear and reinforcement. Some transference. Very wide margins. Else clean.